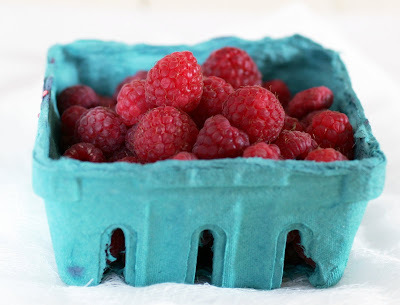 the berries. Any fresh berry—especially wild blueberries—will make a wonderful summertime topping. gourmand—he loved to eat more than just about anything. Jemal loved the taste of cheese-flavored popcorn, in particular, and would wait until I finished eating it so that he could lick my fingers. One terrible day, he ate a bunch of pistachio shells, unbeknownst to me, and stopped eating entirely. 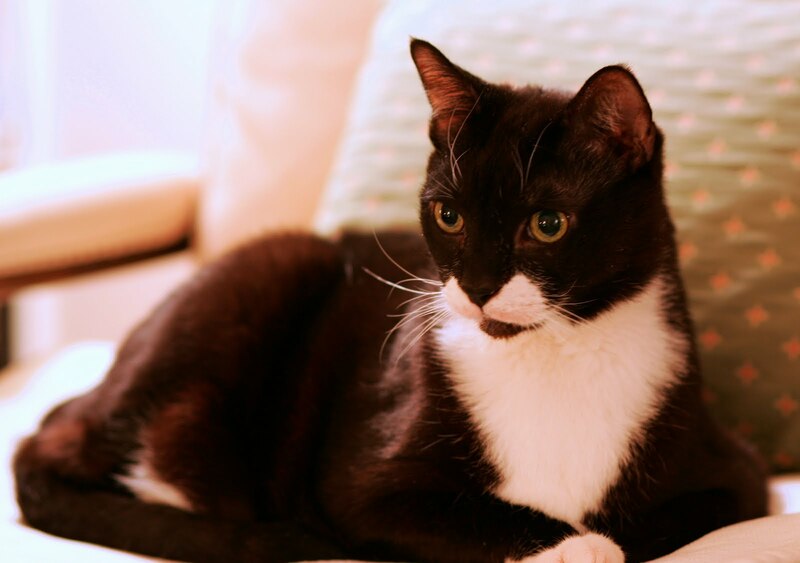 The vet was stymied and, in the meantime, Jemal’s liver began to fail. Specialists, surgery, a feeding tube and $9,000 later, my boy was back to his old self, and he lived happily for another seven years. Life was always an adventure with Jemal, as in the time he somehow managed to disable a bird and bring it into our apartment as a new play-friend. Or when he got pinned behind the hot water heater at a relative’s house for 45 minutes before we could get him free. He was a real character and lived life to the fullest. His spirit will always dwell in my heart. In the meantime, we still have Jemal's sister, Emily, who seems to be thrilled with his demise. After all these years, she's now Top Cat, and she couldn't be happier. Life goes on. 1. In a medium bowl, whisk together the flour, cornmeal and salt. In an electric mixer fitted with the paddle attachment, beat butter and sugar until blended. Beat in lemon zest and egg yolks. Add dry ingredients and beat just until blended. Shape dough into a disk. 2. Place the dough on a work surface that has been lightly dusted with flour. Using a rolling pin, roll the dough out into an 11-inch circle, lifting and rotating the dough often, while dusting the work suface and dough lightly with flour as necessary. Roll the dough up on the rolling pin and unroll it over a 9 1/2-inch fluted tart pan with a removable bottom. Gently press the dough onto the bottom and up the sides of the pan (the dough is delicate—if it tears, simply patch the torn spots with more dough). Roll the pin over the top of the pan to trim off the excess dough. Lightly prick the bottom of the dough with a fork at 1/2-inch intervals. Refrigerate the tart shell while you preheat the oven. 3. Preheat the oven to 350°F. Right before baking, line the dough with aluminum foil or parchment paper and cover with pie weights or dried beans. Place the tart pan on a baking sheet and bake for 20 minutes. 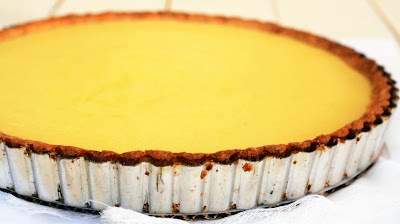 Carefully lift the foil (along with the weights) out of the tart pan and bake the crust for 8 to 10 minutes longer, until lightly golden. Transfer the tart pan to a wire rack. Leave the oven on, but reduce the temperature to 325°F. Place the egg white in a small bowl and whisk it with a fork a few times. Brush the bottom of the hot tart shell with the egg white and let cool. 4. Fill a medium saucepan one-third full with water and bring to a simmer. 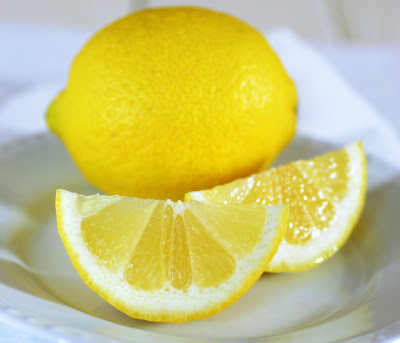 In a medium bowl, whisk together the eggs, egg yolks, sugar and lemon juice and zest. Place the bowl over the barely simmering water (the water should not touch the bottom of the bowl). Cook, whisking constantly, until the mixture is thickened and light in color, about 4 to 6 minutes. Turn the heat off, but leave the bowl over the pot of hot water. Whisk in the butter one piece at a time, whisking until is is completely melted. Pour the filling into the cooled tart shell. 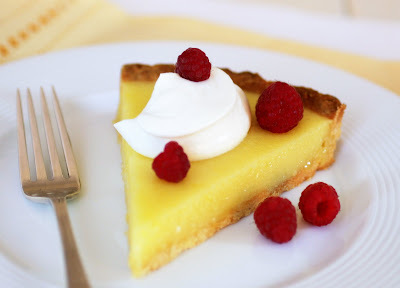 Place the tart pan on a baking sheet and bake for 12 to 15 minutes, until the center is set and the tart is slightly puffed. Transfer the tart pan to a wire rack and cool completely. 5. Combine all ingredients in the bowl of electric mixer fitted with the whisk attachment and beat just until soft peaks form –don’t overbeat or it will become grainy. 6. 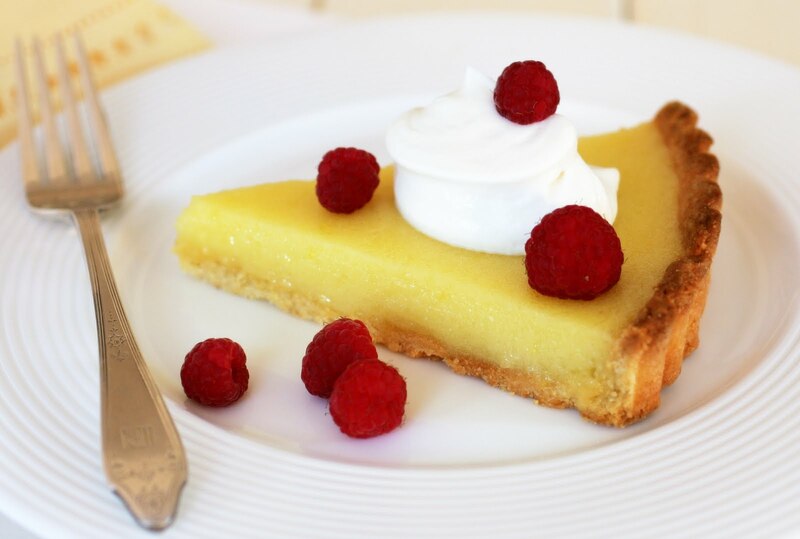 Serve a slice of the tart with a dollop of Mascarpone Cream and some fresh raspberries on top.